Get a fabulous body fast – the healthy way! A healthy shot. Squeeze the juice of half a lemon or half a lime into a small glass, then add a little water and drink. Don’t have lots of water, a small glassful is enough. – Make a de-puff juice. Create a naturally diuretic drink using a mix of either cucumber, fennel or celery as a base, then add a little sweetness with either beetroot, carrot or apple plus a little parsley. Make enough for one large, healthy glassful and drink it immediately. Need an idea or two? – No juicer? Don’t abandon the diet – just add more water to your early morning shot and make it a long drink instead. – Fruit and more fruit. Don’t eat this straight after your veggie juice drink – you’ll create fermentation and, in turn, bloat! 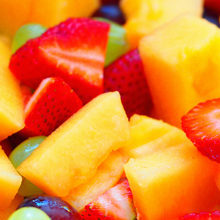 Wait until you start to feel hungry, then eat a bowl of fruit salad or two to three whole fruits. For this week you can eat any fruit for breakfast except bananas, oranges and melon (and no dried fruits, of course). – Easy eating. Hungry early? Don’t wait. Eat at noon if you like, but leave a gap of at least two hours after your breakfast to prevent any bloat and help flatten your tum. 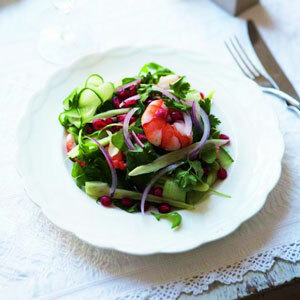 – Lunch should be either a really big mixed salad or a large bowl of steamed vegetables topped with some protein. Choose from organic chicken, turkey or grilled or steamed fish, all about the size of a medium chicken breast. 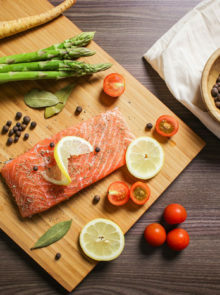 Or have a same-sized portion of canned salmon or tuna. Go for tuna in olive oil, drain away the excess, but leave a little behind – it’s good for you. Tuna in brine should be rinsed to lower your salt intake and help keep the bloat away. Vegetarians can add grilled tofu or cooked pulses. 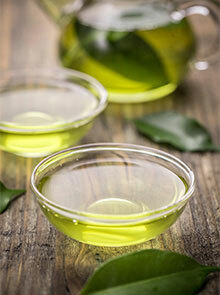 – Dress your salads with lemon or lime juice plus a little flax seed or olive oil and fresh chopped herbs. Add black pepper, but no salt. – Time for a snack, as an energy slump at around 4pm is a downer for slimmers. Perk yourself up with a small snack; very small. 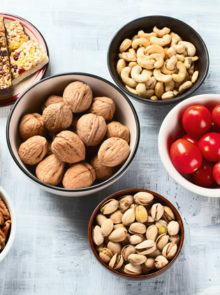 – If you’re working and need a brain boost, eat nuts. Count out either six almonds, six hazelnuts or four big brazil nuts. Chew slowly and deliberately (about 30 times per mouthful). 1. Using a little olive oil, gently cook a chopped onion until soft. 2. At this point, add any spices you fancy, maybe cumin, turmeric, chilli, garlic or ginger, to give your soup a kick. 3. Throw in lots of your favourite veggies in fairly big pieces (but no potatoes) and stir until they’re glossed up. Put on the pan lid and let them all sweat gently for a few minutes. 4. Give your soup body and a golden look by throwing in a handful of red lentils before you add the water – delicious, good looking and a shot of protein. 5. Pour over some water to cover and simmer until the veggies are tender, topping up with water if you need to. 6. Serve as it is or blend half to make a thicker soup, blend all of it to make a creamy soup. 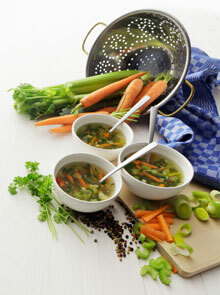 – Eat a big bowlful of this for dinner. If you feel a bit empty at bedtime, don’t go hungry, have another small bowl. – No time to make soup? If you’re smart, you’ll batch cook some and stash it in the freezer before you start the diet. Home-made is definitely preferable, as you control the ingredients and the salt content and you’ll get bigger, chunkier portions. In a pinch, buy a carton of ready-made without cream or grains.